Join the fun on Children Sew Day! Revel Children's area for this free activity. Youngsters of all ages are invited to draw and sew, and those under age 18 can complete the steps and enter to win a sewing machine! Volunteers from Fabric Boutique, Shreveport Sewing Center, Ghee's, and Red River Quilters will be on site to help sewers and artists of all ages! All supplies are provided. This activity encourages youngsters' creativity and interest in sewing. Teach a child to sew and spark a lifetime of creativity! The children's art squares will be used to make quilts for children in area care facilities. Sewing machines and supplies are provided on Children Sew Day by Shreveport Sewing Center, Fabric Boutique, Ghee's, and others for your use, so please thank them for their support. 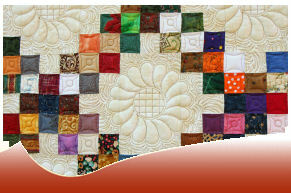 Children Sew Day is sponsored by Red River Quilters. Any questions? Contact Jeannine James. There’s always room for volunteers to help nurture the creativity!